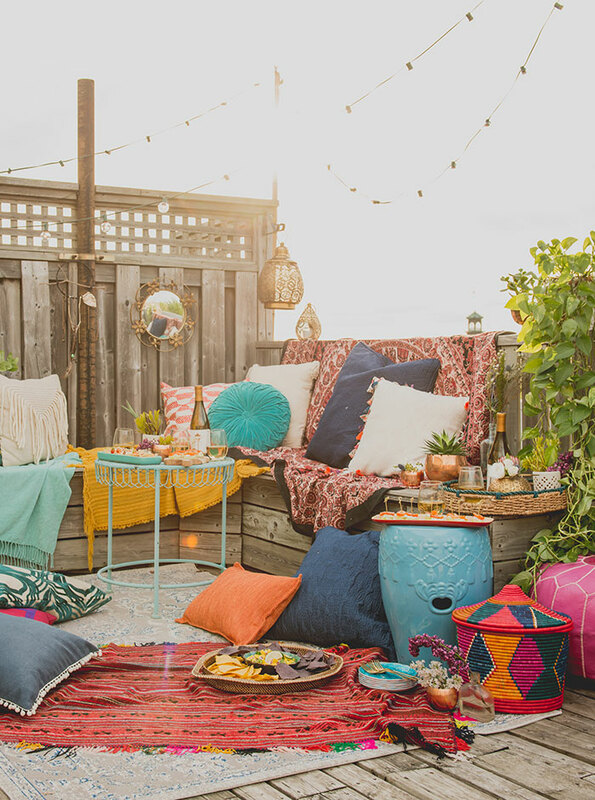 Hey there, it’s Melissa here from The Sweet Escape to share with you a dreamy Boho inspired summer sunset affair I had on my very own rooftop patio. I’m an extremely lucky lady to have this spacious oasis above all the hustle and bustle of the city. It makes staying in the concrete jungle on weekends much more enjoyable, and a lot less traffic! You can find this story and more inspirational summer recipes, entertaining ideas, and DIY projects in the Summer issue of Merry magazine. 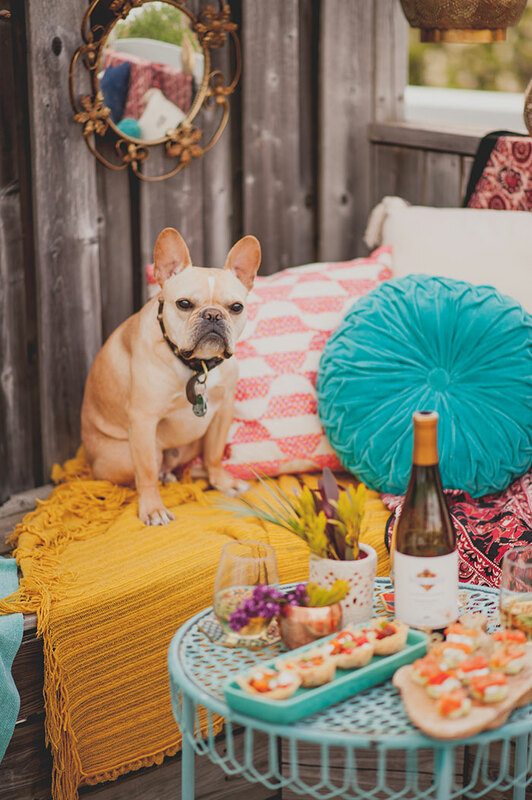 The idea was to get together with a few close friends with some summer sipping wine and a few light appetizers to enjoy the end of a gorgeous summer day. Mission accomplished! 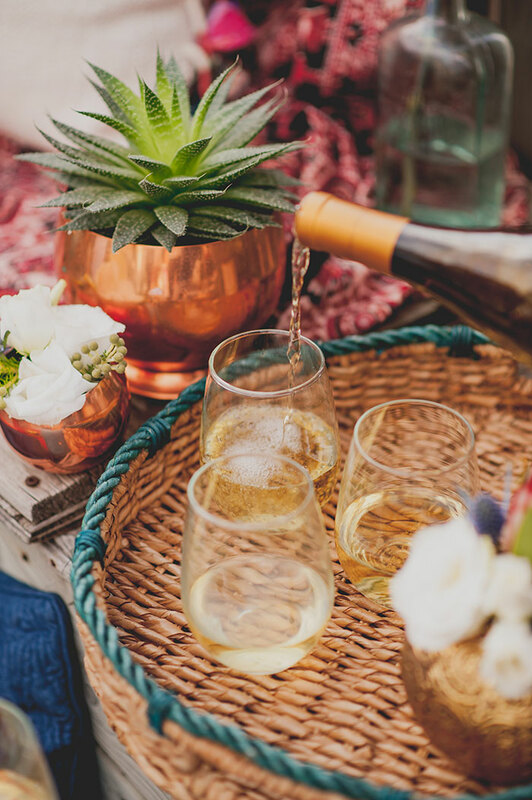 Kendal Jackson’s Vintner’s Reserve Chardonnay is the perfect choice for such an occasion. 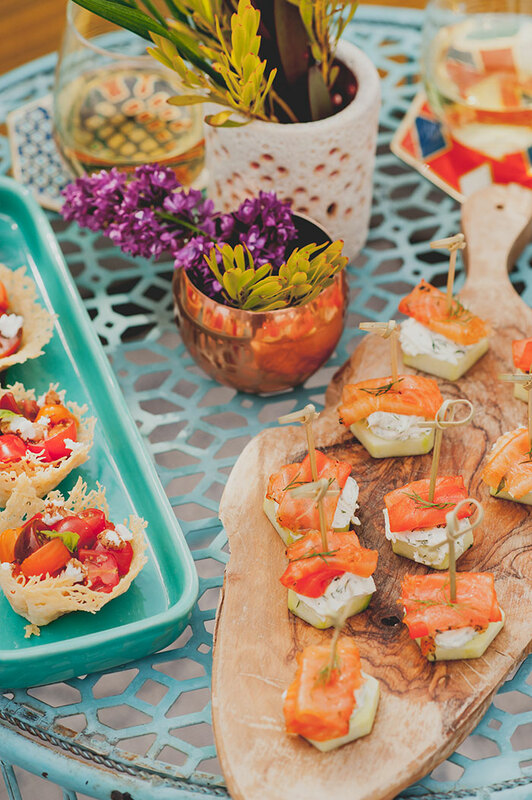 On the appetizer menu we had Creamy Dill Cucumber Smoked Salmon Bites, Mini Tomato Salad Parmesan Bowls, and Mango Salsa. You can find the recipes below. 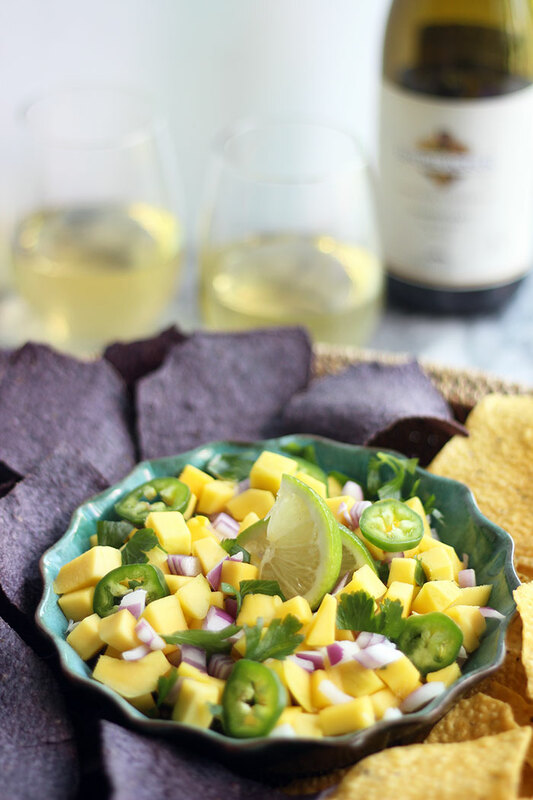 All are light and refreshing and pair well with the Vintner’s Reserve Chardonnay. We had a few unexpected but welcome guests to enjoy the evening although he stuck to water and his own treats. 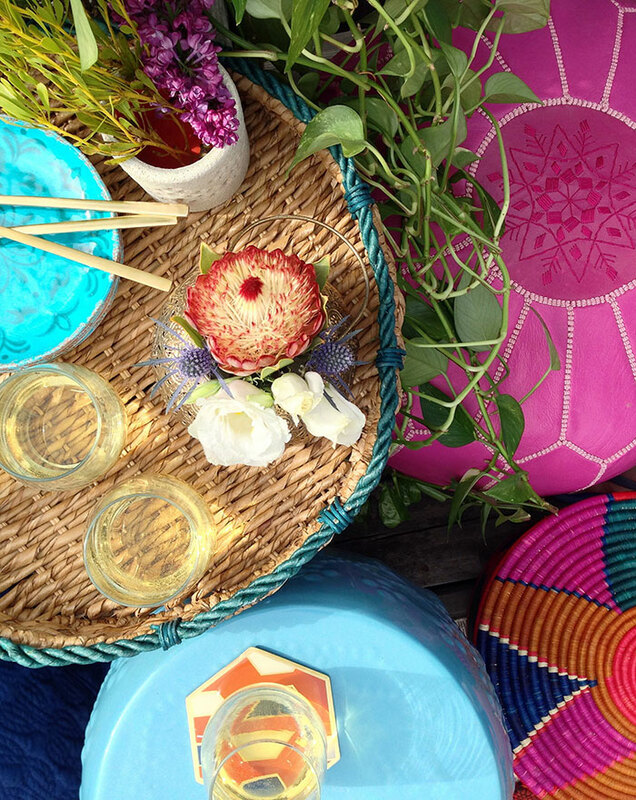 Summer is the time to embrace color in our food and in our decor which is what we did. 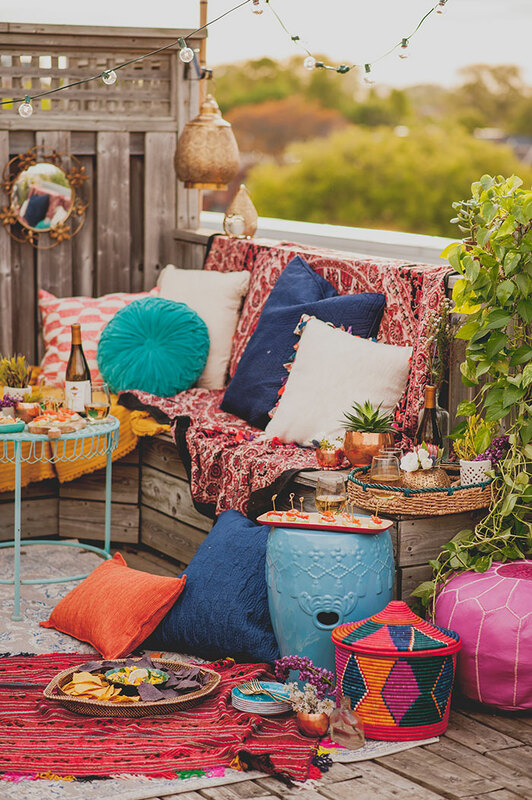 We took the free spirit and casual Bohemian theme and kicked up the color quota by a few notches. 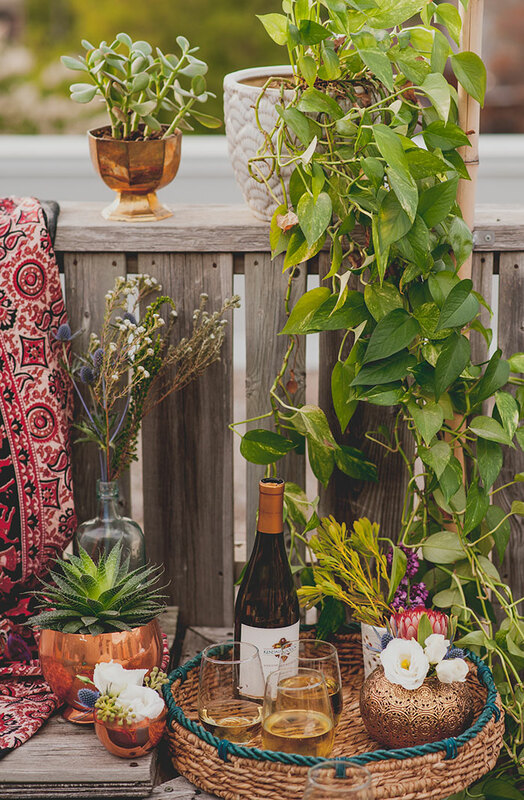 We stuck with simple greens and natural looking florals in vintage thrifted metal planters and glass bottles to compliment the bright colors. 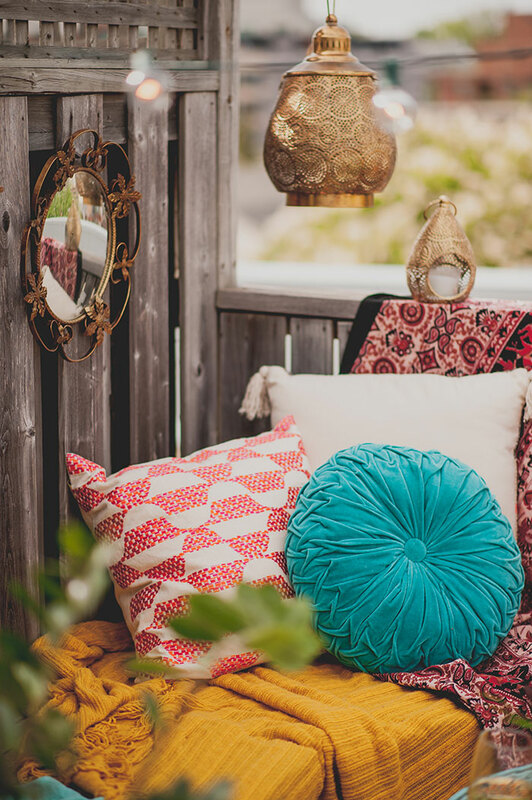 How can you not feel all warm and happy in a place like this with a glass of wine in your hand? The recipes for this evening are easy for any host with zero cooking involved. Who wants to turn on an oven on a summer day or spend time away from their guests cooking and prepping? You’ll need more of a grocery list than a recipe for each of these as there are no strict rules and you can make as many or little as you need. • 8 oz. pack of cream cheese at room temp. Start with about 1/2 of the cream cheese and mix in finely chopped dill to taste with a dash of salt & pepper. Make more mixture if you need based on your quantity. Cut peeled cucumber into generous size wedges. Top with about 1 tsp. 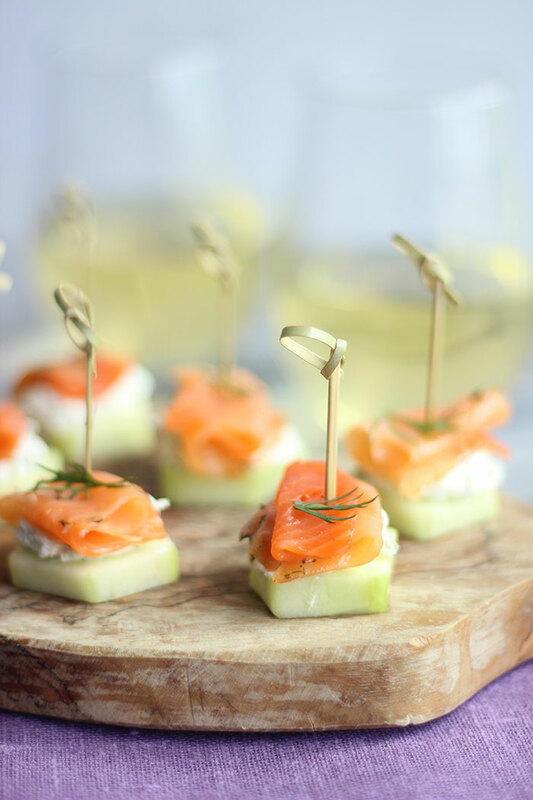 of cream cheese mixture and a small piece of smoked salmon. Keep together & serve with toothpick. Peel and cut mangos into equal size small cubes. Finely chop 1/2 (or to taste) of jalapeno and red onion to taste. Add roughly chopped cilantro and the juice of 1-2 limes (leave a piece or two for garnish) and toss with some salt & pepper. 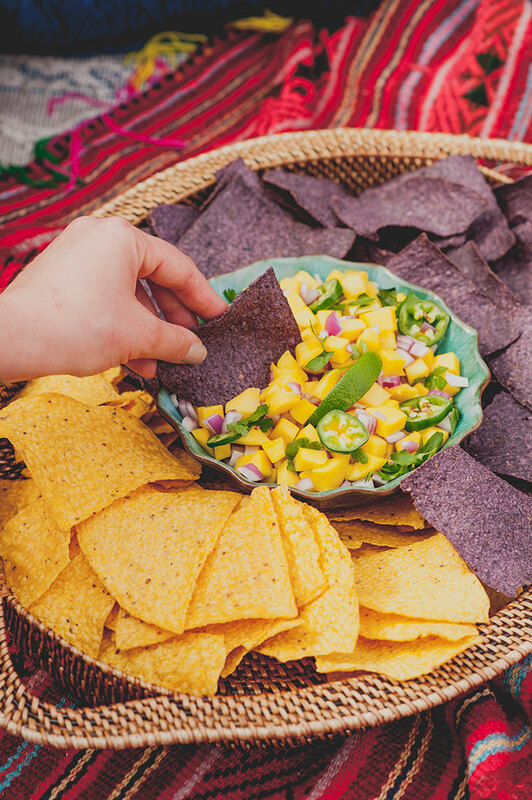 Let sit for at least an hour before serving with corn chips. Set oven to 350°F. These delicious parmesan bowls turn out best if you buy a block of cheese and grate yourself. You need about 25g per bowl so buy a generous size piece. It keeps well in the fridge or freezer for future uses.They can be prepared ahead of time so you’re not doing this while your guests are there. On an un-greased baking pan create palm-sized circles of the grated parm so that you don’t see much of the pan showing through. Put in oven starting at 10 minutes and keep a very close eye on them until the cheese is melted and golden but not so melted that it’s a blob. Have your muffin tray close by and ready as you have to move extremely quickly once you remove them from oven. Remove and quickly place & mold into muffin pan to create a little bowl. They crisp up almost immediately. I suggest only doing 4 at a time. If If you feel confident after the first batch try 6. Once the bowl is cooled you can remove and reuse muffin tray for next batch. In a bowl combine cut tomatoes. Add some pepper if you like but hold back on the salt because the parmesan bowls will be salty. 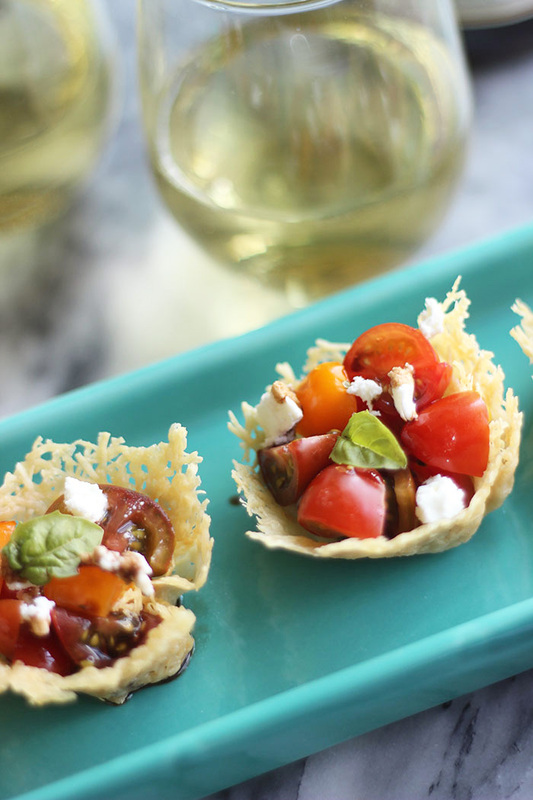 When you’re ready to serve place a spoonful of tomatoes into parm bowls, top with some goat or feta cheese and a sprig of basil and drizzle with high quality extra virgin olive oil and balsamic vinegar. Now it’s just time to sit back and enjoy the good food, good wine and great company. Don’t forget to check out Merry for some other great summer ideas. 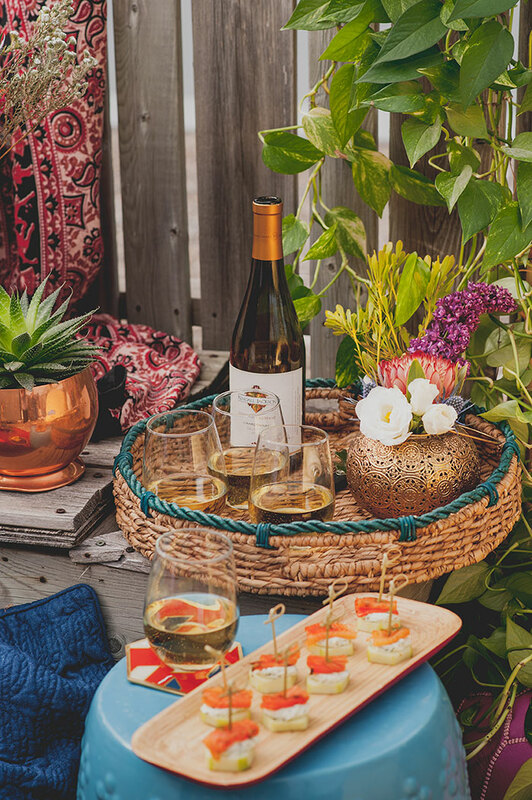 Cheers to a summer full of rooftop get togethers!